This double-sided backdrop TV mount for conventions, trade shows, or business meetings, are meant to house flat screen mounts between 26” and 40” weighing less than 25 lbs. 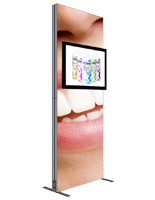 This silver display system supports interactive presentations and videos with places for such equipment. This backdrop TV mount, also known as an entertainment center, comes with two fabric custom artwork banners. Users need to download templates and submit a backdrop design during checkout. 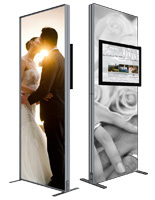 This aluminum and fabric display is 94.5 “ tall and will definitely capture customer attention due to its height and sleek design. 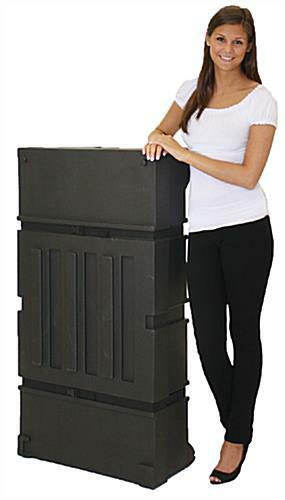 The TV mount that is an aluminum flat panel fixture comes with a hard carrying case to protect things during transport. Shop this website for the full line of fixtures constructed in other materials, including steel, and glass. 35.5" x 94.5" x 19.8"
50.0" x 29.0" x 12.0"